An ex-convict who finds out he is actually a Norse God and gets mixed up in a battle between New Gods and Old Gods, of which Old Gods have incorporated in American life and are pretending to be normal people. 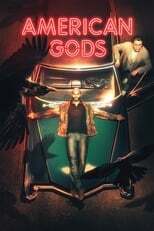 Where can you stream American Gods? On 2017-04-30 Drama/Mystery TV Series American Gods first aired on Starz. Written and created by Michael Green & Bryan Fuller, and produced by FremantleMedia North America, American Gods will return and was last broadcasted on 2019-04-14.